Orange County Mayor Teresa Jacobs recently joined the business community and tourism leaders at the Westgate Lakes Resort & Spa for its new mixed-use retail development groundbreaking in south Orange County. The new retail center, Westgate Lakes Retail Village, located on Turkey Lake Road, will provide additional shopping amenities and will provide another exciting destination for tourists and guests from around the world visiting Orange County. 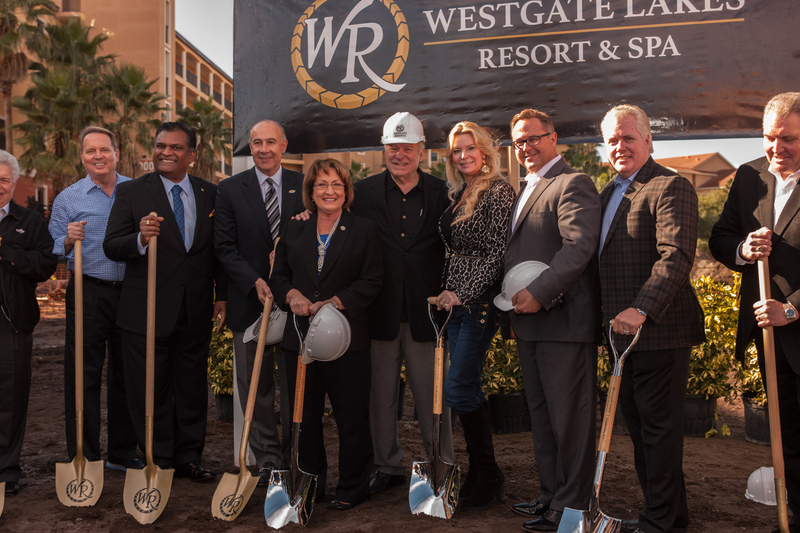 Mayor Jacobs helped break ground on the new $11 million dollar project and congratulated Westgate Resorts CEO David Siegel and his team on this significant economic development announcement, which took place at the site of his flagship resort in the heart of Orlando’s tourism hub. Westgate, based in Orange County, is the largest privately owned timeshare company in the world, with 27 themed destination resorts. Mayor Jacobs and tourism industry leaders lauded the ongoing growth of International Drive, which continues to attract visitors from around the world. Visit Orlando CEO George Aguel and Orange County District 1 Commissioner Scott Boyd also spoke at the event and thanked Siegel for his substantial contribution to Orange County. The new center, Westgate Lakes Retail Village, will introduce the company’s premium dining concept, Edge Steakhouse, to Central Florida. At the Westgate Park City resort in Park City, Edge is recognized as one of the best steakhouses in the state of Utah. The village will include Drafts Sports Bar & Grill, retail shops, a full-service marketplace grocery store, a game room, a two-lane bowling alley, a 450-space parking garage and additional 32,000 square feet of flexible banquet and meeting space. The first phase of construction is scheduled to finish in April 2015, and both the Edge and Drafts will open in June. A collection of photos from the Westgate Lakes Retail Village Groundbreaking are available on Flickr for use by the media.